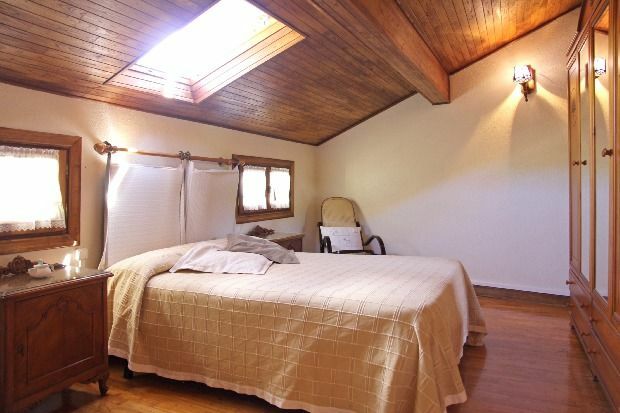 House in the center of the village of 600 h, very well located with all kinds of services, health center, pharmacy, restaurants, municipal swimming pool, covered fronton, tennis court. Ideal for hiking, mountain, mountain biking, mushroom picking, near the beach. Located in the Western Pyrenees, where the mountain crests lean their heads towards the sea, the valleys of Baztán, Bidasoa, Cinco Villas and Malerreka offer the traveler the evergreen landscape of the meadows, the changing color of the beech forests and ferns, the noise of the water that runs in a thousand streams and regattas, the mild climate that equally gives shelter to the cultivation of the kiwi or the palm tree. To enter these valleys is to meet some people who have known how to preserve their traditional culture, who proudly show their language, who continue practicing their oldest sports, who exhibit with satisfaction the work of their many craftsmen, who know how to enjoy making others part of it. of a varied and rich gastronomy. This is a territory where one can meet nature, where the traveler can feel the strength of the authentic throughout its 830 square kilometers, which travel in all directions roads and trails. To the north of Navarre, very close to the sea and the beaches, bordering France, are these towns and places that we present to you now. Baztán, Bidasoa, Cinco Villas and Malerreka are the 'quiet villages'. Igantzi village of 600 h. with all kinds of services. Cozy house, very well located near a trade. Municipal swimming pool and tennis court. Ideal to spend unforgettable holidays in a green landscape. Well connected, near Donosti, Hondarribi, Hendaye, Baztán and Doneztebe. para hacer turismo por la zona de Donosti, Navarra, Francia, etc muy bien comunicado.